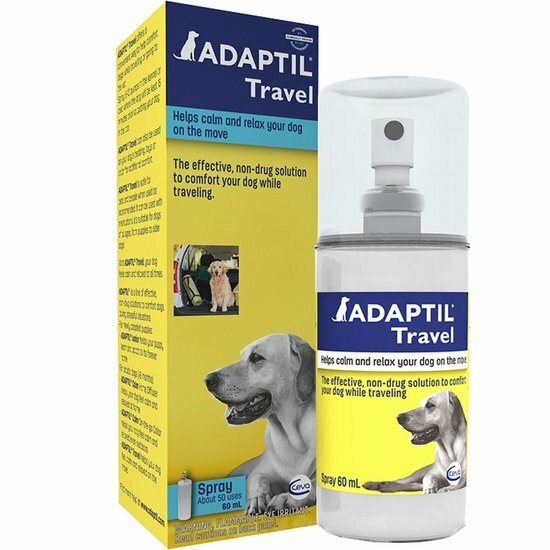 ADAPTIL Travel Spray provides �comforting messages� (dog appeasing pheromones) that help dogs feel calm and relaxed when traveling in the car or visiting the vet. These odorless messages are only perceived by dogs and provide a strong signal of security and comfort. Cats and people are not affected. I have two pups that stress out whenever they are left alone for a period of time. My vet recommended this product and I trust that she knows about pets that get left at their practice over night or more for many reasons. I spray it on a handkerchief, wrap it around their neck and out the door I go. This product is amazing! My little ones don't like it when I have to go to work, so I kennel them and spray Adaptil on their blankets and they are calm and not the least upset. Most places I checked out only sold this product in a 20ml but Healthy Pet sells it in 60ml. Much more cost effect. ProsI will be ordering this product again. My Vet recommended this product for one of my dogs. She is petrified of storms, fireworks and just plain rain now. While I had her in their office, they sprayed it on a scarf and put it on her. It was raining at the time, and we couldn't get her calmed down. Within about 30 minutes of putting the scarf on her, she had calmed down. This product is well worth trying if your pets have this problem as well. ProsVery easy to use and no side effects.